The value was $58.48 well over the $10 I paid. The lip color is blah pink that did nothing for me. The China Glaze polish in Marry A Millionaire is a fun purple, silver and aqua glitter. The Model Co. blush in Peach Bellini is a peachy color that will be very versatile. First Love Roll on perfume oil was okay, I was not crazy about the scent. It smelled very old lady like. I’m anxious to try the Glam Glow Brightmud Eye treatment, well maybe not after I read some reviews online. Some say it burns your eyes. Overall, I’m only keeping the blush and polish, the rest are going in the stash I’m saving to send my 18 year old niece. Having had an Ipsy.com subscription for over two years, I’ve gotten a ton of stuff. I got the above referenced eye shadow last year. I only use it on the weekends when I really want my blue eyes to stand out. I wear glasses so every little bit helps. It is the most beautiful bronzy shade I have ever seen. It has flecks of blue in a bronze base. I went to the company website today to get pricing, and they only sell it in a palette of 18 shades. The price is right, at only $7.95 for the palette. 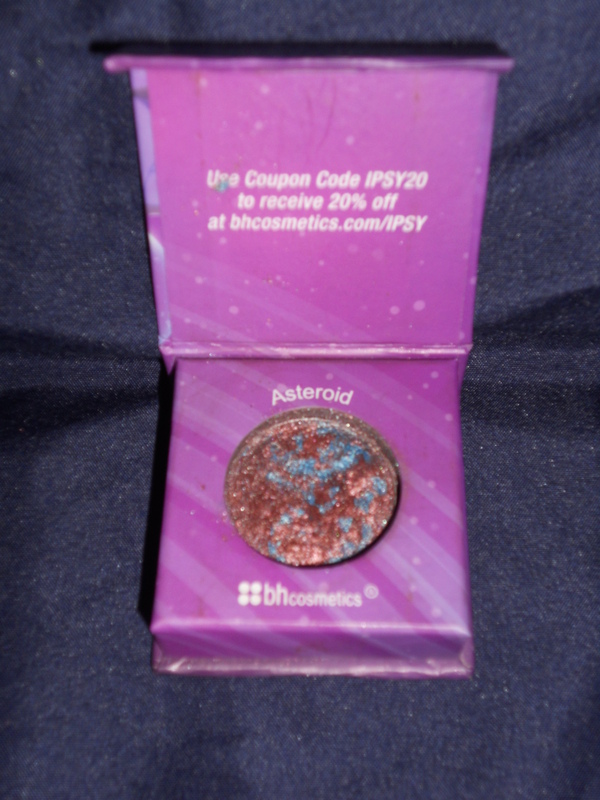 Well I don’t need 18 more eye shadows, so I found it on EBay, and I’m bidding on it right now. Dang, if I had only known I wouldn’t be able to find it again I would have bought more last year. This is what happens when you have so much flipping make up like me. I can’t help it. I love trying new things, and hate to throw stuff out in case I might use it someday. That was how I discovered Josie Maran 100% Argan Oil. I had gotten it in one of my Ipsy bags, and used it for a rash I had on my face. Not only did the Argan Oil clear up my rash, but my skin looks amazing now. I think I need to start using all of the Ipsy stuff more often. 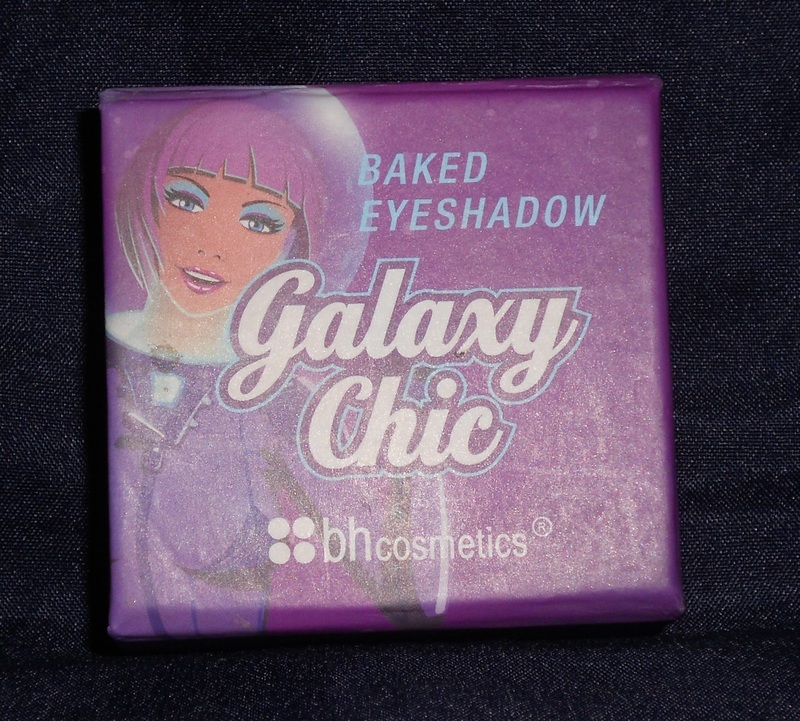 Here are some photos of how awesome this eye shadow color is. If anyone knows of a similar color, please comment below. Oh and I know my brows need some help. They are blonde, and a bit sparse, but I’m working what I got. Hopefully I’m not heading to Joan Crawford town with my brows. Plus I’m basically blind without my glasses, so I’m thinking it may be time for one of those handy dandy magnifying mirrors. Man it’s hell getting old. Thanks! Oh Ipsy, how I love thee. I’ve been an Ipsy subscriber for over two years. Every month I get five make up related items. I usually get three full size products along with deluxe samples. A cute make up bag with a different theme each month completes the order. I only pay $10 a month, and can cancel at any time. I recently tried Lip Monthly and Boxy Glam. I was disappointed and cancelled both subscriptions. 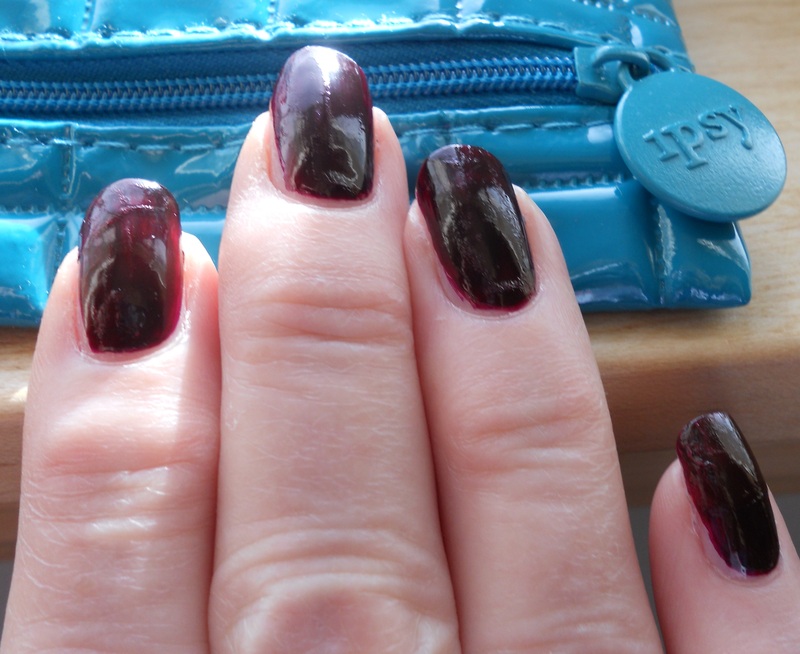 This month’s bag is Fearless Heroine. I got a nice sized black and plum make up bag. My bag included full sizes of an eyelash curler by Precision Beauty, NYX Butter Lip Balm in Parfait and Cailyn Just Mineral eye polish in Orchid. Rounding out my order were deluxe samples of BWC Facial Cleanser with a 3% AHA complex, and Tarte- Lights, Camera Lashes 4 in 1 mascara in black. I found pricing on all items except the Tarte mascara, with a value of $26. The eye shadow alone was $15. I am rarely disappointed with my monthly glam bags. The Cailyn Just Mineral Eye Polish in Orchid is a pale pinky gold color that is shimmery. This will make a great highlighter color. The NYX Butter Lip Balm in Parfait is a natural pink tone for when you just want a little lip color. Plus you don’t need a mirror to reapply since it’s a balm. This month’s bag was definitely a winner. In the past, whatever I didn’t want (which usually isn’t much) I send to my 18 year old niece. Her mother died 12 years ago, so I send her a fun care package every few months. OMG! I think this is my favorite bag yet! The Nicole by OPI nail polish is to die for. It is a super cool dark cherry red color. The VolumEyes mascara by Model Co. is awesome. I’ve already used it twice since I got my bag on Oct. 17th. It’s a blackish gray, that really brings out my blue eyes. Of course I poked myself in the eye this morning, being in a hurry as always. I think I’ll save this mascara for the weekend. The name says volume, but I got amazing length as well. I also got Epice Purifying Exfoliant which I’m anxious to try. My bag also included Rose Berry Figs and Rouge hand cream. It smells like a delicious fruit tart. I don’t know if I want to eat it or just put it on my hands. Last but not least I got some lip gloss by Starlooks in Guilty Pleasure, a soft rosy color that smells like candy. This was a nice way to end my lousy week. The teal quilted cosmetic bag was the icing on the cake. Enjoy! ipsy.com, you are the bomb! Yippee! I got my September Ipsy glam bag today. Lots of good stuff. The cosmetic bag is a pewter colored bag with silver studs. The five items I received are as follows: Briogeo Don’t Despair, Repair deep conditioning mask for hair. I can’t wait to try this, as I color my hair and need a deep conditioner. Leeanni Eco 3 in 1 Revolution Light, a toner, serum and moisturizer combined. Sounds like this will save me some time in the morning. Pacifica Natural Minerals eyeliner pencil in brown. Hikari lipstick in Cabernet, which is a dark pink, matte lipstick. Last, but certainly not least is a Crown Crease/Shadow brush. This is the third eye make-up brush I’ve gotten from Ipsy. I love the fact the brush is a dual brush. The bristles are very soft, and the brush is well made. I wasn’t real crazy about the lipstick, as the color was a bit too bright for me. I wish I had a purse that looked like the cosmetic bag for this month. I’m such a little kid waiting for my bag each month. I knew it was coming today, and had my hubby throw the pink package upstairs to me after he got the mail. He asked me how I knew it came today, and I told him I saw the fuchsia package as he was walking up the driveway. I will most likely give the lipstick to my niece. She loves getting packages from her aunty, because she knows she’s getting some great hair, make up and skin care products.